Each extension in TYPO3 CMS can bring the file ext_tables.sql that defines which tables and fields the extension needs. Gathering all ext_tables.sql thus defines the full set of tables, fields and indexes of a TYPO3 instance to unfold its full feature set. Some functionality in the Install Tool can compare the defined set with the current active database schema and shows options to align those two by adding fields, removing fields and so on. When you upgrade to newer versions of TYPO3 CMS or upgrade an extension, the data definition of tables and fields might have changed. The TYPO3 CMS Install Tool will detect such changes. What this tool does is collating the information from all ext_tables.sql files of active extensions and compare it with the current database structure. It then proposes to perform the necessary changes, grouped by type: creating new tables, adding new fields to existing tables, altering existing fields, dropping unused tables and fields. You can choose which updates you want to perform. You can even decide not to create new fields and tables, although that will very likely break your installation. 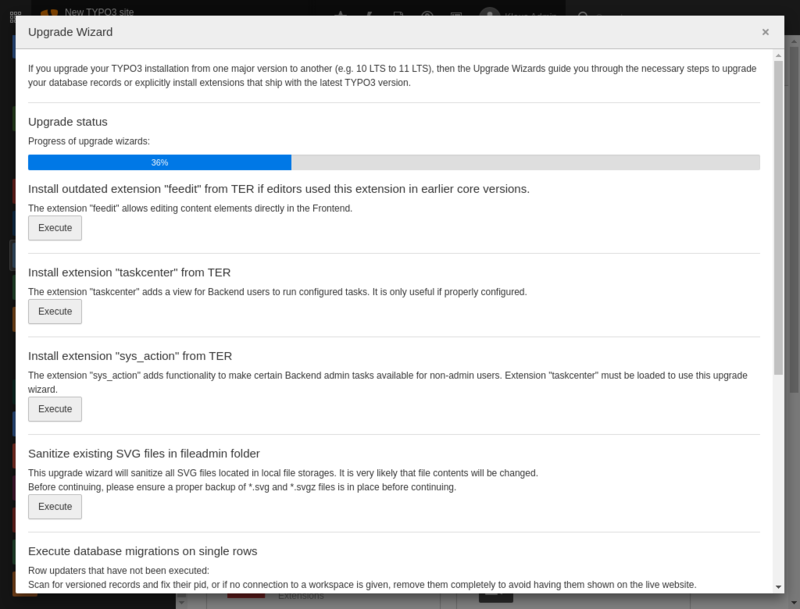 More information about the process of upgrading TYPO3 CMS can be found in the Installation and Upgrade Guide. As mentioned before, all data definition statements are stored in files called ext_tables.sql which may be present in any extension. The classes which take care of assembling the complete SQL data definition will compile all the CREATE TABLE statements for a given table and turn it into a single CREATE TABLE statement. If the table already exists, missing fields are isolated and ALTER TABLE statements are proposed instead. What this means is that - as an extension developer - you should always have only CREATE TABLE statements in your ext_tables.sql files, the system will handle them as needed.